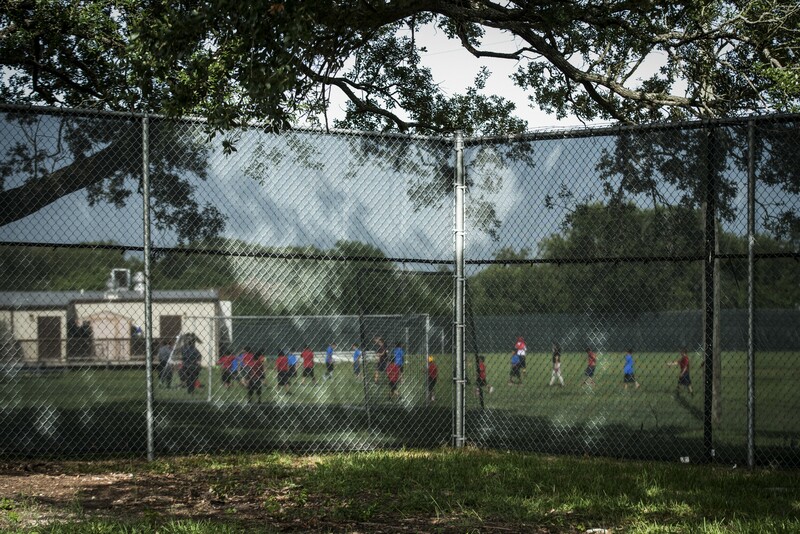 Unaccompanied migrant children at a shelter in Houston, Aug. 14, 2018. The number of migrant children being housed by the Health and Human Services Department, which oversees the shelter system, has increased more than fivefold since last summer. Population levels at federally contracted shelters for migrant children have shot up more than fivefold since last summer, according to data obtained by The New York Times, reaching a total of 12,800 this month. There were 2,400 such children in custody in May 2017. The huge increases are due not to an influx of children entering the country, but a reduction in the number being released to live with families and other sponsors, the data collected by the Department of Health and Human Services suggests. Some of those who work in the migrant shelter network say the bottleneck is straining both the children and the system that cares for them. Many are teenagers from Central America, and they are housed in a system of more than 100 shelters across the United States. The new data shows that despite the Trump administration’s efforts to discourage Central American migrants, roughly the same number of children are crossing the border as in years past. The big difference, said those familiar with the shelter system, is that red tape and fear brought on by stricter immigration enforcement have discouraged relatives from coming forward to sponsor children. Shelter capacities have hovered close to 90 percent since at least May, compared to about 30 percent a year ago. “The closer they get to 100 percent, the less ability they will have to address anything unforeseen,” said Mark Greenberg, who oversaw the care of migrant children for the Health and Human Services Department under President Barack Obama. Facilities like the one in Tornillo are also more expensive to operate, according to Rep. Rosa DeLauro, D-Conn. She said such facilities cost about $750 per child per day, or three times the amount of a typical shelter.